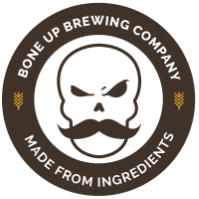 Stats: Out of Bounds - Bone Up Brewing Co.
Food Pairing: A burger with bacon and steak sauce. Best Occasion to Drink: While yelling at your putter. Brewers' Notes: We got talkin' with our friends over at Thomson Country Club about makin' a special beer for their clubhouse and I daresay we hit the dang ol' nail on the head* with a beer that encapsulates the spirit of the place: nice and bright, a little earthy, a touch grassy, and - of course - named Out of Bounds to celebrate their... well defined golf course. It goes great with a round of golf, but it's just as good if you skipped that round because of some injury you made up (and let's be serious, everybody probably knew that you didn't have "sudden-onset ankle toxmosis"). * I feel like there's gotta be a comparable golfing version of this phrase, but all I could come up with was "hit the ball on the... ball" which doesn't really have the same zing to it.